Singing her way though life with one word, “La,” a little girl beckons with her inner song, complete with a full range of meanings: of fear, frustration, loneliness, resignation, hope, and satisfaction. 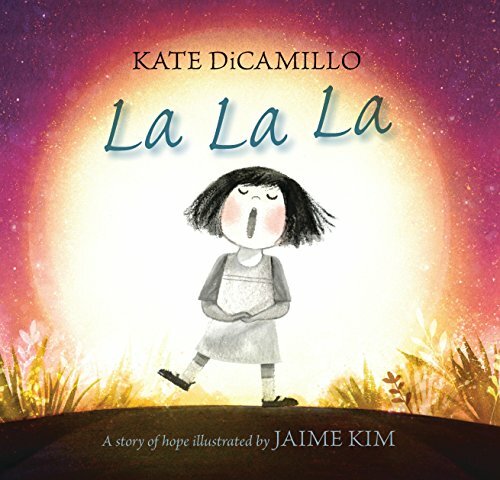 DiCamillo is no stranger to powerful storytelling with a 2001 Newbery Honor winner (Because of Winn Dixie, 2000), a 2004 Newbery Medal winner (The Tale of Despereaux, 2003), a 2014 Newbery Winner (Flora and Ulysses, 2013), and countless other awards for novels, early chapter books, and picture books already under her belt. This impressively decorated author knows how to spin a tale. Set graphically with clear delineations between a white box of a room and a mysteriously alluring forest, our young protagonist is determined to make a connection. She is adorable and persistent. In full vibrato she belts out her la, la, la’s. However, she is not content to entertain herself alone in her bare room. Attracted to the flutters of fallen autumn-colored leaves, she runs along, following them precariously close to the edge of her comfort zone. With tentative step she crosses into an entirely new world. Once there, her confidence resumes and her song returns. “La,” she sings, “la la, la la la, laaaaaaaaa!” One can palpably hear the crescendo. Looking, hunting, hiding, seeking, in and among the plant life, for something, anything, to answer her song. Alas, there is no response. She returns to her room and sets herself down, with the straggling leaves on the edge of the two worlds, still pondering what could possibly be out there for her. Night falls and the colors shift. Purples replace oranges and greens. A steady, hearty silver glow lights up the pond. Little girl wanders back to the moonlit forest. She sings out again, this time, the moon is her target audience. Deducing that she needs to get closer to be heard, she hauls in a ladder. When there is still no answer, she mopes in retreat to her white washed room and falls asleep on the floor. No sooner do her soft “zzzzz’s” start up than a really big “LA!” awakens her. It may have taken some transmission time, but she is finally rewarded with reply. The moon itself is singing, in harmony, one can hear, with the little girl. This story is all expression as shown in the little girl’s face, her movement, and her energy. Each block offers a chance for the reader to contemplate, dialogue about emotions and build their own interpretations. It can be a heavy read, or a lighter one. For Kim, she thought of her deep relationship with her sister. She “. . . tried to capture the relief, the overwhelming emotion, and the joy of finding the most precious friend in the world.” It is touching to make the realization that, when all else fails, one will never be alone while there exists a moon.